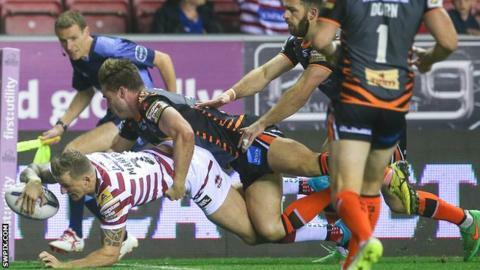 Wigan Warriors missed out on the League Leaders' Shield to Leeds Rhinos, despite thrashing Castleford Tigers. Castleford led 12-10 at half-time but were unable to stem the flow as Wigan ran in seven tries after the break. But with the game won as Larne Patrick went in late on, all eyes and ears were on Leeds in action at Huddersfield. Ryan Hall's late try at the John Smith's Stadium dampened the atmosphere and ensured Wigan would face a home semi-final against the Giants. Shaun Wane's Warriors returned to action after their derby defeat by St Helens and made a thunderous start, crossing early on through Dom Manfredi and Matty Bowen to lead 10-0. The visitors fought back with Luke Dorn and Junior Moors scores to lead at the interval, but the second-half response was huge as the hosts completed their part of the deal if they were to finish top of the table. Warriors winger Manfredi raced in a further three times to complete his quartet of tries and after Matty Smith's drop goal, scores from George Williams, Oliver Gildart, Joe Burgess and Patrick sealed a comfortable win. There was a surreal atmosphere for the final five minutes with victory secured, with little attention paid to the match being played before a crowd of more than 15,000 at the DW Stadium. But once news of Hall's try filtered through, the Wigan fans were left to dwell on what might have been. "I am proud of them. At half-time I told them at the moment you are going away for a semi-final. "In the second half we were dominant. I thought it was a fantastic win. It doesn't feel like a defeat but it's not far off. "It is what it is, I have to congratulate Leeds. They have stayed in there and battled until the end. "I am a massive believer in you get what you deserve and we have not deserved to win it." "We served ourselves up at the start of the second half. A really disappointing half of football, if you lack as much control as that against a side like Wigan then they are going to punish you. "We didn't apply any pressure at all. I thought we were superb in the first half with 100% completion - it was probably 50 in the second - and if you want to be a top-four side you have to be better than that. "It was pretty dismal and disappointing to slip out of the season." Wigan: Bowen; Charnley, Gildart, Burgess, Manfredi; Williams, Smith; Crosby, McIlorum, Flower, Tomkins, Farrell, O'Loughlin. Castleford: Dorn; Robson, McMeeken, Gibson, Solomona; Roberts, Gale; Lynch, Milner, Millington, Holmes, Moors, Wheeldon. Replacements: Cook, Maher, Springer, McShane.